Includes printed jumpsuit, padded shell on reverse, padded and printed knees and elbows and 4 different coloured eye masks. Ages 5-6yrs. 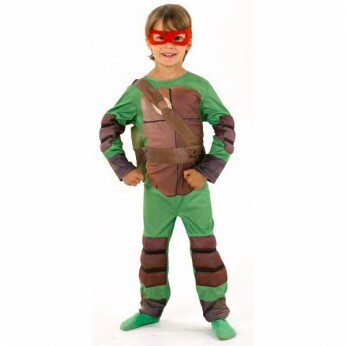 Take on the deadly Shredder with this awesome Teenage Mutant Ninja Turtles costume. You’ll get all four coloured eye masks so you can bust out the sewers and tackle the bad guys as either the leader Leonardo, Donatello, Raphael or Michelangelo; whichever your favourite hero in a half shell is! Includes jumpsuit and 4 coloured eye masks. General information: Height 45cm; Weight 400g; For ages 5 years and over; EAN/MPN/UPC/ISBN: 883028681266. WARNING(S): Not suitable for children under 3 years old. This toy costs approximately £22.99 (for the latest and best prices make sure you check our retailer list for the Turtles Deluxe Medium Costume above). In our review of Turtles Deluxe Medium Costume we classed it as being suitable for ages 4 years, 5 years, 6 years, 7 years, 8 years but recommend you check the manufacturer specific advice before purchasing.